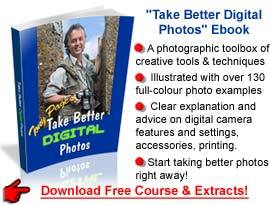 Get rid of blurry photos due to camera shake: hold your Point and Shoot (compact) camera steady using these tips from Tony Page of Travel Signposts Photo. It might be more difficult keeping your Point and Shoot steady than a DSLR, but you can still get sharp photos at surprisingly slow shutter speeds if you follow a few simple steps. 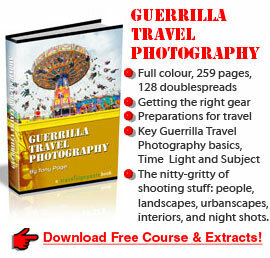 “Tony Page here from Travel Signposts Photo again, and we’re still on the subject of the Dreaded Curse of Blurry Photographs and how to avoid them. 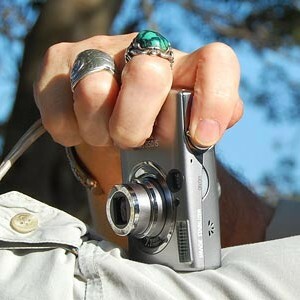 Today we’re going to talk about point-and-shoot or to be more polite, the compact cameras and how to hold them steady. As I said before this is much more difficult than holding a DSLR (single lens reflex), and there’s a reason for that, it’s because they’re so small, they’re small and they’re light. That’s why pros like heavy cameras: it’s because it’s easier to hold a heavy camera steady. Okay so here we are, we’ve got our cigarette-pack size compact camera with its LCD on the back. Now the manufacturers, to save a bit of money, have done away with viewfinders on most of these cameras. That’s another big problem, because without a viewfinder we can’t use the tripod method that I mentioned before of holding the camera against our forehead and bracing it that way. Of course, if you have a viewfinder that’s better, although the viewfinder in these small cameras don’t tend to be very good, frankly. So let’s assume for the sake of argument you haven’t got a viewfinder. Now which bright spark thought up this design as far as consumers are concerned I don’t know, because we have all seen people wandering around holding their cameras out at arm’s-length, squinting in the sunlight at their LCD, trying to work out whether or not they’re getting a good shot. You see the cameras waving around in the breeze like windmills. The only way we do get a sharp shot – or that we get away with it – is because we’re using a fast shutter speed in bright sunlight. But we’ve all had that disappointment when the light is maybe not so good and the camera automatically selects a slower shutter speed, of finding out that our photos are blurred. Now maybe if you just want to use them very small, they’ll still be okay but if you want to use them any size at all, you have to be more careful. Okay, so what are we going to do with this? We can’t put the camera up to our eye, so we have to hold it at least a foot or two away from us. Now don’t hold it out at arm’s length. This is the secret. Try and brace your elbows against your body – I know it’s difficult! First of all let’s talk about holding the camera horizontally. You’re holding the camera with two hands and you can maybe brace it by holding your thumb on the bottom and the left-hand finger up the side, and with the right hand you’re operating the zoom with the thumb and the shutter with your finger. Now frankly I find it totally impossible to zoom smoothly and take a photograph at the same time. I always first select the zoom I’m going to use and then concentrate on taking the image. Don’t forget you’ve got to squeeze the shutter very carefully, because with a small camera it’s so easy to get the dreaded ‘Slanties’ – hey we’ve all done that! I remember Helen my wife used to have a lot of problems with that and to be blunt, I did too. No matter how softly you squeeze that shutter sometimes the horizons are just not straight. So you’ve got to be really careful on that. Squeeze it slowly and don’t press to hard and jab at it, otherwise you’ll never get it straight – trust me, I speak from experience. Okay, so let’s sum up: we’ve got our elbows braced against our body, we’re holding the camera in two hands and we’re squeezing the shutter very slowly. Now vertically you may well find that you can put the index finger of your left hand right up the side of the camera and put your thumb along the bottom. Then carefully brace the camera with the thumb of your right hand and squeeze the shutter button slowly with the index finger of your right hand. That’s the best you can do. Where possible try and get closer to your subject and don’t use a long telephoto because unless you’re using a fast shutter speed – and we’ll talk about later – you will find it very difficult to get a stable photograph.